On the Cover: On page 575, Christopher J. Cornelius and colleagues discuss the optical transparency of water swollen TEOS-1-TIP-1-PBC1.5 nanocomposite films. The film’s opaque nature is attributed to light scattering due to differences in refractive index created by water swollen sulfonated domains (sPS) that are in contrast to unsulfonated domains (HI and tBS), but increasing TIP concentration led to film transparency. Nanocomposite films transitioned from translucent to optically clear, revealing a morphology change from ordered to random. AFM phase images reveal a microphase-separated morphology attributed to interfacial interactions between TIP rich inorganic domains and sulfonated groups. DOI: 10.1002/polb24300. Fei Huang, Wenjian Zheng, Armin Tahmasbi Rad, Mu-Ping Nieh, Chris J. Cornelius. February 2017. The role of TEOS-TIP within a pentablock ionomer: Morphology, physical properties, and ion transport. 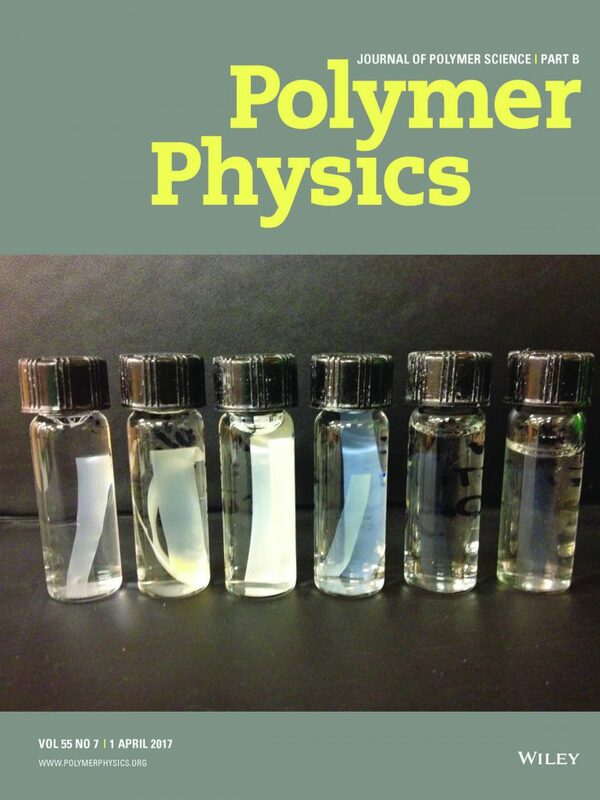 Polymer Physics 55(7), pp. 575-586. Fei Huang is a postdoctoral associate in the Department of Chemical and Biomolecular Engineering. Wenjian Zheng is a graduate student in the Department of Chemical and Biomolecular Engineering. Chris Cornelius is professor in the Department of Chemical and Biomolecular Engineering.